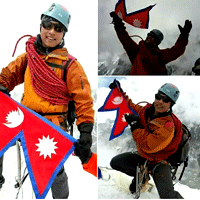 Prakash Rai is one of the best Experience fluent English speaking trekking and mountain Climbing guide from Nepal wilderness trekking (Pvt). He is from Khumbu Region of Kanku Village. Since 2007 has been working in our agency as a senior guide with many experiences of high passes and peak climbing too. He is the honest, loyal and familiar in any trekking of Everest region, Annapurna region, Langtang region, Manaslu and Rolwaling Circuit.